Censor boards in Qatar, Bahrain and the United Arab Emirates have sunk Darren Aronofsky’s new Biblical epic, Noah. The Paramount movie is now banned because it allegedly contradicts Islam by portraying a prophet and no one in these countries can see an alternative account of religion other than Islam. To be clear, I have no intention of seeing this movie which I view as an entirely silly concept. I do not know the point of this film but I really do not want to spend the time to find out (even if it would seem a bit of a challenge to remake a 600-year-old biblical guy into a buff action hero). Aronofsky has said that he is most concerned in bringing “nonbelievers” into the movie to watch the story of the biblical hero. Egypt is moving to also ban the film to protect the faithful. The leading Sunni Muslim institute Al-Azhar declared that the film is “contrary to faith and to the fundamentals of the Islamic Sharia [law]” and insult the “feelings of the faithful.” Given the country’s blasphemy law, that view would potentially allow for criminal charges. By the way, the same fate awaits any film that “characterizes Allah’s prophets and messengers and the companions of the Prophet [Muhammad].” The key in enforcing orthodoxy is to deny any alternative view to be seen or heard. The reaction of these religious, free-speech-hating fanatics almost makes me want to go out and buy a ticket. Almost. Movie Selection of the Fittest: Creationists Block Internationally Acclaimed Movie on Darwin From Being Shown in U.S. In an act of utter cowardice, United States distributors appear to be caving into a creationist campaign to bar the movie Creation on the life of Charles Darwin. The film explores his loss of faith following the death of his beloved 10-year-old daughter, Annie. I wasn’t the person who brought up the “wacko” subject. Nick was. To No Prophet–The Catholic Church, as well as other Christian Churches, have suggested that their parishioners see/not see certain movies. They never stopped believers, nor non-believers from seeing the movies, nor did they stop Hollywood from making them–obviously. Elaine–there are plenty of wackos to go around, religious, atheist, heterosexual and homosexual, political and non-political. It affects all races, creeds, and philosophies. 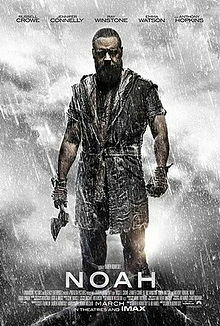 The movie of Noah is another Hollywood writer’s, director’s, and producer’s dream to make money. They could care less about the story’s authenticity. As for Muslim’s banning it that’s their prerogative–for a group of people who don’t believe in movies, they must be going to them to ban them–or perhaps they watch them on the internet. I suggest you wait for a Christian movie company to make the movie–it’s surely will be more authentic. Giovanna. In Chapter 8 of Tim Wu’s book “The Master Switch” he explains in detail how the Legion Of Decency threats of boycot forced Hollywood to abide by the “Production Code” drafted by Jesuit Priest Daniel Lord with the result that mkovie production changed dramatically and believers and non-beliers alike were effectively denied access to artistic creation. Well, Mr Brian Harris, I think you have a few screws loose. On the one hand you are claiming a scientific approach to very unscientific religion. The rest is a bunch of pompous nonsense. For reference purposes and not to suggest any sort of credential thereby, I happen to be a member of the International Society for Biosemiotic Studies. What, on earth or elsewhere, is the adjective, “Biosemiotic” about? To me, and, methinks, to other semioticians and biosemioticians, semiotics is a name for the science of signs and that which signs signify. There is a foundational principle in my understanding of semiotics and biosemiotics, to wit, no sign can ever be what it signifies. In the realm of language as signs of meaning, and, incidentally, quite in accord, as I observe, with S. I. Hayakawa’s work, Language in Thought and Action, no sign can ever be what it signifies. For those who “believe” in words having plain meaning, my grasp of semiotics relentlessly clamors to inform me that no word, or combination of words, can ever have any plain meaning such that a judge, or anyone else, can accurately find the plain meaning of a word sequence composed in the past with respect to any subsequent signified event. Interpretation of words is inseparable from the use of words. The interpretation of a word sequence made by any given particular person is a property of the person’s prior exposure to the words of the sequence; therefore, interpretations of words may vary dramatically from one person to another, and that is an aspect of the mapping of words as symbols or signs with what the words symbolize or signify in a specific context. Information theory and communication theory (stuff I studied in graduate school) inform me that, without exception, the mapping of sign to significance or symbol to symbolized is profoundly overall context-dependent. There is a remedy, error-recognizing and error-correcting intrapersonal and interpersonal communication. There is a word-name for one method of error-recognizing and error-correcting communication, and that word-name is “dialogue,” as, for example, in the work of what was The Dialogue Group at the Massachusetts Institute of Technology. Ruel Howe wrote a book, “The Miracle of Dialogue” about the error-recognizing and error-correcting nature of dialogue in human communication. Martin Buber’s I and Thou is another view of dialogue. So, it appears to me, is much of the writing of Dostoyevsky, as I have read it in English translations. The predicament, as I recognize it, of dialogue is its effective demolition of adversarial processes in human communication when dialogue is used effectively, efficiently, and economically. A perhaps-useful book which touches on the semiosis of words and plain meaning is the book by the late Loyola Law School Professor, Robert Benson, The Interpretation Game: How Judges and Lawyers Make the Law, Carolina Academic Press, 2008. Some people misread/like to interpret other people’s words. As a member of the non-sectarian ordained clergy and as a licensed professional engineer holding professional and doctoral (research) degrees in bioengineering, I regard religion as a valid area of bioengineering research in the form of a profoundly socially significant aspect of developing theoretical and applied-theoretical biology. My approach to, and understanding of, “religion” is that of a professional scientist and professional engineer. I find that I am not less than the third generation in my family to engage in the work of understanding religion from the view of science; my dad, Rev. Emerson W. Harris, was a Carleton College philosophy major who also had a minor in biology, His dad, Rev. Harry R. Harris, was an amateur scientist and a master carpenter, and studied for the ministry at Moody Bible Institute, in Chicago, where he met his first wife, my dad’s mother. I have a stack of letters written to my dad by his dad, my grandfather’s interest in the relationship of science with religion is, to me, vividly apparent in those letters. My dad and I talked at great length and in great depth about the nature of human biology and human religion. My dad served various congregations in the Congregational Christian Churches and in the United Church of Christ. His dad served various congregations in the Congregational Churches and in the Congregational Christian Churches. Accordingly, my life includes no legal doctrines; no stare decisis, no dicta, no holdings and no precedent not subject to scientific scrutiny and, whenever achievable, scientific refutation. As a so-far inviolable, essential and foundational, scientific principle of my life, I never believe anything merely because someone tells me to believe it, or merely because I am severely physically and psychologically punished for not believing it, or merely because someone claims to have any authority over me and my life, whatsoever. Bullying, in every form I have yet encountered it, has invariably, to date, informed me that what I am being bullied about in an effort to make me believe it has to be at least partly false because only the shattering coercion of bullying seems able to make people believe that they believe whatever it is that can only be taught through bullying. Religious indoctrination has always been, as I have observed it, of one or more aspects of horrific socialization-induced traumatic brain damage. I find it eerie that people today actually believe the stuff they read in religious texts. And, then make laws based upon it. No wonder humans are stuck in limbo. Look up the definition of equate and compare. Learn the difference. LMAO! What a piece of work. Since I FINALLY got you to admit Muslim fundamentalists are worse then Christian fundamentalist then we are in agreement. All of this gnashing of teeth was wasted, negative energy. Learn from this. I just saw the trailer for ‘Noah’. I will pay a few bucks to take the wife out to see it! Elaine, exactly. He’s been doing the same thing to me on the two different Muslim threads. He’s attempting to make the argument we are equating Christian fundamentalism with Islamic fundamentalism, well in my case he is. It’s his way of building a straw man and then trying to get us to defend the straw man HE built. It’s a dishonest tactic that most people can easily see through. You fail to understand that I didn’t EQUATE one thing with another. You’re the one who said that I did. You’re the one who is attempting to define the purpose of my comments. I really don’t care if you agree with what I have to say. This is a blog that welcomes people with different opinions. When you have people killing doctors who legally do abortions, others who bomb abortion clinics, those who band together to bomb IRS offices and who form paramilitary groups with names like ‘Christian Identity’, then I think you can make some comparison. There are more than you think.